The field of optogenetics was named “Breakthrough of the Decade” by the journal Science in 2010. Simply put, optogenetics is about controlling electric activity in cells using light pulses. For instance, light signals can be used to activate neurons. This has led to many new insights into Parkinson’s disease and other neurological and psychiatric disorders such as depression and schizophrenia. Georg Nagel, who has been a professor at the Julius von Sachs Institute of Biosciences at the University of Würzburg since 2004, is one of the pioneers of optogenetics research. In 1995, Georg Nagel and Ernst Bamberg were the first to demonstrate that a light-driven proton pump made of archaebacteria can be built into vertebrate cells where it actually works. In 2003, they were able to demonstrate this with light-driven ion channels based on algae. In the following years, Nagel continued to push optogenetics research together with other researchers. 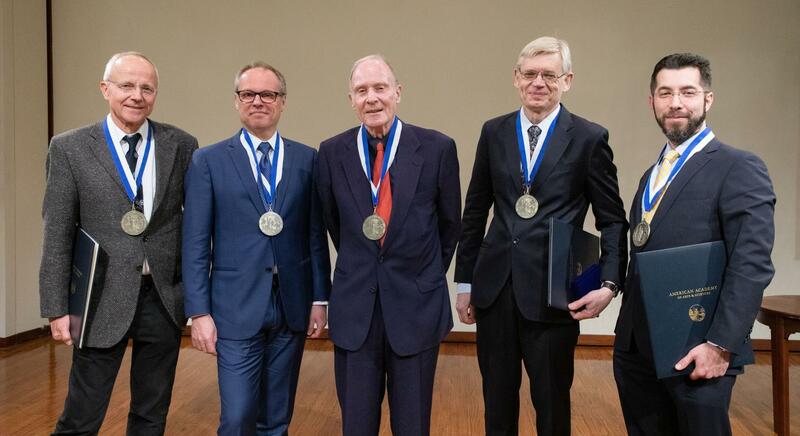 Nagel has now been distinguished for these achievements: On 11 April 2019, he received the Rumford Prize of the American Academy of Arts and Sciences in Cambridge (USA) along with other optogenetics pioneers. The other awardees are Ernst Bamberg (Frankfurt/Main), Ed Boyden (Cambridge), Karl Deisseroth (Stanford), Peter Hegemann (Berlin) and Gero Miesenböck (Oxford). Founded in 1780, the Academy has awarded the Rumford Prize since 1839 to recognize discoveries in the fields of heat and light. Last presented in 2015, the academy presents the gold-plated silver medal whenever a significant achievement is made in one the two fields. According to Lucia Rothman-Denes, a member of the Academy’s Prize Committee, optogenetics has revolutionized the field of neuroscience. She believes that the work undertaken by these scientists has had a profound impact on cell biology and microbiology. David W. Oxtoby, the President of the Academy, was delighted to add the six researchers to the distinguished lineage of scientists who have been honoured by the Academy. At the University of Würzburg, Georg Nagel is currently working with light-driven ion channels from the group of rhodopsins and light-activated adenylyl cyclases. His team cooperates with physiologists who use these photo receptors as tools to manipulate cellular functions through visible light. Nagel also tests whether these photo receptors can be integrated into plant cells. Nagel has received multiple awards in recognition of his research in optogenetics. He won the Karl Heinz Beckurts Prize (2010), the Wiley Prize in Biomedical Sciences (2010), the Klaus-Joachim Zülch Prize (2012), the Prix Louis-Jeantet (2013) and the Grete Lundbeck Brain Prize (2013). In 2015, he was elected a member of the EMBO (European Molecular Biology Organisation, Heidelberg). How does dark play impact the effectiveness of serious video games?